The bookmaking workshop with George really helped me to realise this. I started off by making a book about the objects in the story, depicting them in a literal and graphic way using collage. However as the day continued, I realised that I needed to make my images quicker, and so I tried to be a bit more abstract and quick. We had a look at everyone's books they had made so far and I realised that I didn't need to be so literal, as many other people had been taking a more abstract approach. 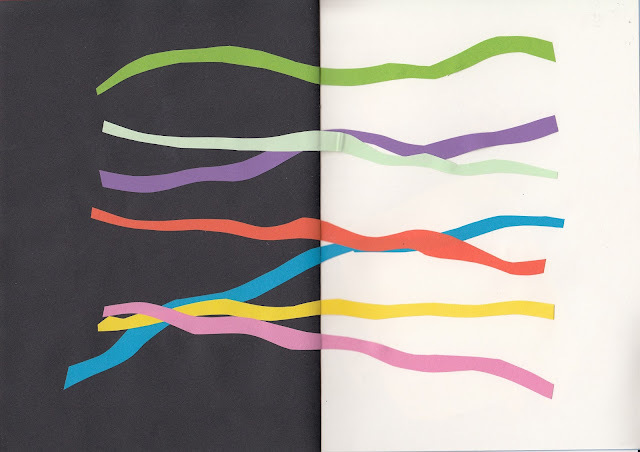 This led me to making this double page spread, exploring the idea of the fan and coloured streamers. I like this page as an image, however I think it would look better using textures to make the streamers, rather than coloured paper, as I think they are slightly too bold. I would also like to explore the condition of them, for example making them discoloured or frayed, which would give a different message. I would like to use this idea and image in my illustrations, however I think that it would have to be for the book cover, as I don't think this image would work in a portrait format. If I do want to explore the emotion of the story through the objects, I think I need to show how the characters interact with them, and what their relationship with the object is. For example if I chose to look at the acorn, I need to think about the emotions behind her keeping such an insignificant object for so long. I would like to try and show this maybe without actually showing the whole character in every illustration, as this would then leave a bit of space for the reader to imagine the story too. I think I will continue to use collage to try and create these illustrations, and edit them on Photoshop afterwards.